I call this my “Tiny Square Black Center” Box. On the top of the box is an “Aunt Sukeys Choice” quilt pattern. The square box is about 3 1/2" x 3 1/2" and 2 1/2" tall. Inside it is 2 1/2" x 2 1/2" x 1 1/2". I made it using 92 pieces of wood cut in either diamond or triangle shapes from different kinds of wood. I used the half size pieces for the “Aunt Sukeys Choice” pattern on the top, so there are 40 pieces where I would normally have 20 pieces. The box is finished in its natural color with 5 or 6 coats of a clear wiping varnish, rubbed in by hand. The pieces are a bit over 3/16" thick, glued onto a Baltic Birch base, so they hold up much better than a thin veneer. The type of wood is listed on the bottom of the box from the center out. 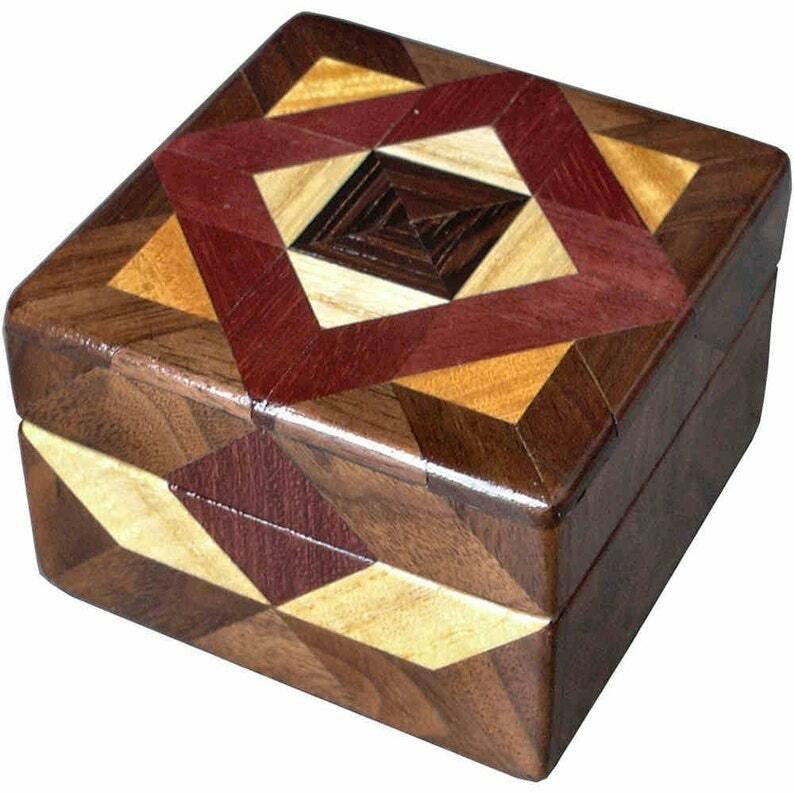 On this box the wood is “Wenge” from West Africa, “Hackberry” from Missouri, “Purpleheart” from Central or South America, “Satinwood from Sri Lanka and “Walnut” from Missouri. I made this box in 2001. On the bottom I signed it, listed the wood, and dated it. After the date, the words “Foot Cut” let you know I made it on a foot powered table saw. You can buy a matching set of 2 different boxes or Lazy Susans with this design and coloring. The square box is just right to some of your favorite jewelry. My wife uses one to hold bobbins for her sewing machine. Go to my ”Shop Polices” and “Profile” page to see my return policy and other information on how I make these. To see other small boxes I’ve made, click on “Small Boxes” or whatever gets your interest under “Sections in this shop”. The “Home” page itself can be rather confusing with everything mixed up. The “Sections in this shop” lets me show you all like items together as a unit.